Brighton silver and tigers eye bracelet. 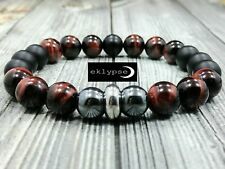 Gemstones: Matte Black Onyx (10mm), Hematite (9mm) and Red Tigers Eye (10mm). Style: Beaded (On 1.0mm super strong & stretchy clear elastic cord). Handcrafted with Natural Gemstones. Bracelet fully customizable. Materials:Natural Stone. Color:As picture. Beads size: 8MM. Lot of two adjustable semi-precious stone bracelets. One is White Agate and the other is made of Tiger's Eye. Gemstone: 8mm Tiger's Eye. Size: adjustable. Women & Men 10mm Natural Gemstone Round Stretch Bracelet Healing Reiki 7.5"-9"
Beaded Bracelet, Green Tiger Eye & White Howlite Stones, Chakra Bracelet. Material: Non Magnetic Hermatite. Bead Size: 6.46 mm. Color: Black. Item Details. Men's Women Lava Tiger Eye Stone Lion Buddha Beaded Elastic Bracelet Bangle 2pcs Color:Black;Brown Material: Lava/Tiger Eye Stone Alloy Size:8.7"(22cm)*0.31"(8mm) Beads Width:0.31"(8mm) Weight: 10g(Approx) This bracelet is 100% Brand New And High quality.Its special design will make you look unique. It is a good gift for your lover,family,cowoker,friends.It make you charm and elegant. Brand Unbranded Style Chain Metal Alloy Metal Purity Unknown Main Stone Lava/Tiger Eye Stone UPC Does not apply MPN Does not apply EAN Does not apply Material Lava/Tiger Eye Stone&Alloy. 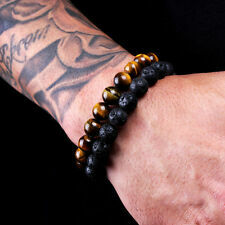 Item Number: WAB187-T Package Included:1 Piece Color: As pictured Materials:Tiger Eye These bracelets are 100% brand new and high-quality. Its special design will make you look unique, charm and elegant. It is a good gift for your lover, family, coworker, friends.